No one could find Mohammad. 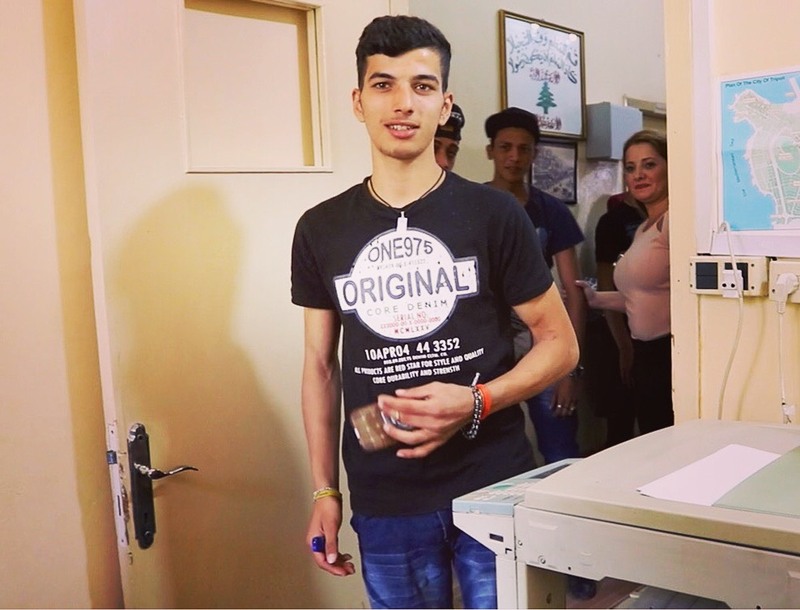 I walked into his school with one goal: do a follow-up interview with the 18-year-old Syrian refugee, whose life story had blown me away just a couple weeks before. My heart sunk to my stomach. I couldn’t believe it. I knew why Mohammad was in jail, but something about the situation made me sick. I had nothing to do with it, yet I felt guilty. Just two weeks prior, the polite and charming boy — with almond-shaped brown eyes and spiked hair — told me about his tragic journey from Syria to Lebanon. At the start of the war, he’d see dead bodies on his walk to school in Aleppo. One time, his friend got hit by a grenade right next to him. In 2011, at the age of 12, Mohammad and his family fled to Tripoli, Lebanon for safety. But they couldn’t have picked a worse city. The Syrian war spilled into the northern Lebanese city between 2011 and 2014. That’s because one part of Tripoli is predominantly Sunni — a sect of Islam that supports the rebels fighting President Bashar Assad. Another neighborhood is Alawite — a group that sides with Assad. About 200 people were killed during that time, according to Time — including Mohammad’s brother. In 2014, the 11-year-old was walking to a mosque to pray when he was killed in an explosion. The memories from Syria and Lebanon still haunt Mohammad — but he's never had the chance to deal with the pain. His focus has been on work. Since stepping foot in Lebanon, he’s worked full-time as a painter to help support his parents and seven siblings. Not only was he robbed of his brother — he was also robbed of his childhood. Finally, at 18, Mohammad decided enough was enough. He wanted to chase his dream of being an accountant. He enrolled in Nasamat Al Shabab, an informal school in Tripoli aimed toward refugees. The problem is, informal programs, like Nasamat, are not certified by the Lebanese government. So students like Mohammad will never get a diploma, a way into college, and -- most likely -- a decent-paying job. That hasn't stop Mohammad from trying. He’d go to class from 8 a.m. to noon; take a two-hour drive to work; work from 4 p.m. to midnight; get home by 2 a.m.; and then do it all over again. He makes $10 a day — which goes toward rent for his family’s tiny apartment. He had been in school for a month. He was getting better at math. He saw a bit of hope. That’s when it all came to an end. For the third time in four years, Mohammad was arrested for being an illegal immigrant. Lebanese police stopped him on the street and asked for I.D. When they realized he was illegal, they put him back behind bars. Mohammad told me he and his family were legal their first year in Lebanon, but haven’t been able to afford the annual $200 residence fee since. As the teacher told me Mohammad was in jail, I had a major wake-up call. I stood in that dirty, old building in Tripoli, holding my $900 camera that I’m probably not using enough as I should. I’m in Lebanon, with the chance to chase my dreams — but sometimes get so afraid of failure, that I hold myself back. Sometimes, I make videos and don't upload them because I worry what people will think. Sometimes, I don’t videotape at all because it’s new to me, and I’m afraid the final product won’t be perfect. Sometimes, I write stories and don't post them because I'm afraid they're not groundbreaking enough. As a result, I spend too much time worrying instead of simply DOING. And here was Mohammad, working six days a week to support his family and not keeping a dime for himself; going to school on just a few hours of sleep despite the fact that it won’t earn him a diploma; ducking from police on his way to school and risking jail time for an education; and doing his best to pay attention in class while battling depression from losing his brother. I have every opportunity at my fingertips, and yet I struggle to grab them. Mohammad has everything going against him, and yet he keeps pushing toward his goal. After I heard he was in jail, the principal could see I was visibly upset. “Nothing,” I said. “I’m just so lucky."